MemTest is a simple application, the objective of which is to analyze the RAM memory to check if there are errors. 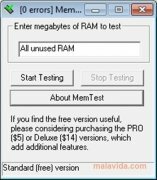 If you notice that your computer isn't working all that well, you can use MemTest to see if the problem is in the RAM memory. It's very easy-to-use, and you only have to allow the program to analyze the system's RAM memory modules. Once the analysis has finished you'll obtain the results and the status of the memory. The RAM memory is the memory where the computer stores the data that is being used at that moment in time. If the computer works slower or freezes, you can check if there was an error in the RAM. MemTest will complete a full check on all the modules. To be able to use MemTest you have to close all your programs. Furthermore, the analysis can take up to 20 minutes. MemTest also allows you to choose the amount of MB that you want the application to analyze. Once it has finished scanning, you'll be able to see the errors that is has detected and the RAM memory's status. 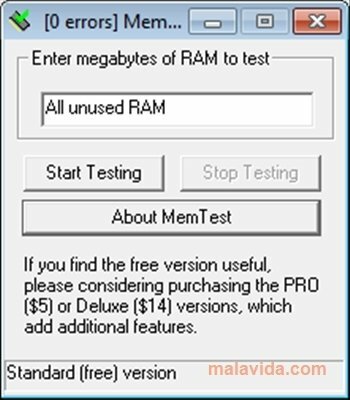 Use MemTest to check how your RAM memory is working and make sure it doesn't have any errors.